If you can't tell from the title, today's post is all about cute things. Specifically, it's about how cute things make people act weird. Take, for example, the following passage. "He reached in front of him and took both of Sybil's ankles in his hands. 'I'm Capricorn,' he said. 'What are you?'" Seymour takes Sybil's ankles into his hands. Am I the only one who finds this strange, but also totally realistic? I'm sure there are a million different ways you could read this symbolically, but at its most basic level, I think it's just a good observation of human nature. Dogs, babies and small children inspire odd behavior in adults. Most people wouldn't gape at strangers in the face, or coo at them, or reach out and scratch them behind the ears. Yet I see people doing these invasive sorts of things (and more) all the time, to babies and dogs they don't even know. Meanwhile, their moms/dads/owners look on, unperturbed (or so it appears). I suppose once you're a dog owner or parent, you give up some rights to privacy, simply because your dog or kid is just too darn cute. I try not to infringe on strangers' personal space like that when it comes to babies or dogs. But I must admit that I gawk at people's food. I probably inherited this trait from my mother. It's tough—no, nearly impossible—not to peek at other the next table's order whenever I eat out. It may make me look like a creeper, but hey, if it helps ensure that I order the best thing on the menu, why not? Do you know what I think of as the cutest pasta? It's a close tie between orecchiette and fusilli. But lately, fusilli has been winning. 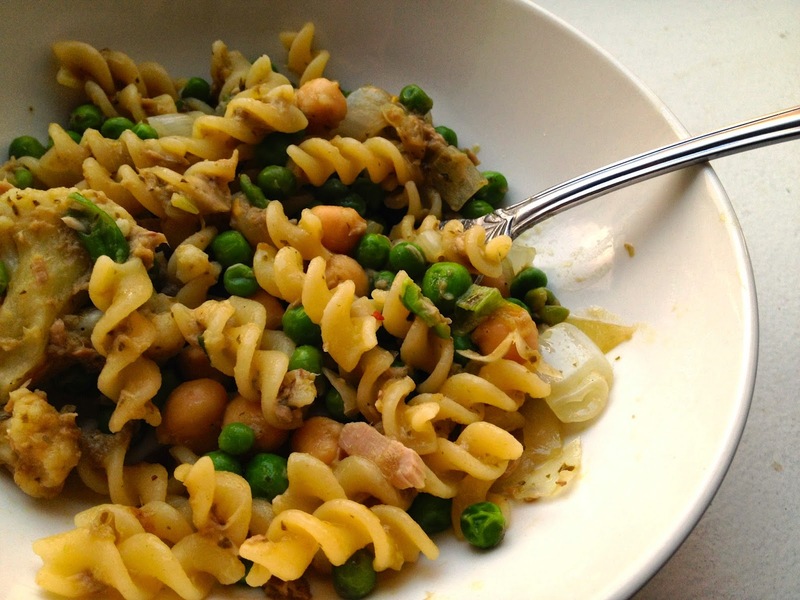 It also goes really well with tuna because the tuna gets caught in the nooks of the fusili. A really corny person would chuckle and call this "two peas in a pasta" because there are two "peas" in it: peas and chickpeas. So that's what I'm calling it...because I am that person. It also happens to sound like "two peas in a pod" which, we all agree, is a cute expression. So, this blog post really is all about cute things. I warned you, didn't I? Meanwhile, drizzle olive oil into a large saucepan or wok and set over medium-high heat. Sauté the onion and garlic for about 10 minutes, stirring occasionally. When the pot of water comes to a boil, cook the pasta to al dente according to the package instructions. Meanwhile, add the pesto, chickpeas and tuna to the saucepan/wok. Stir in the peas. Cook for another 5 minutes and then stir in the drained and cooked pasta. Turn off the heat and serve immediately!